Until recently we really haven’t had to buy much clothing for Jack–gifts and hand me downs constituted the bulk of his wardrobe and we just added in a few things for fun or necessity here and there. But as October loomed near I realized I had nary a long-sleeved shirt in his size, nor much else to fit him over the next few months (but once he gets out of the toddler sizes he is SET with hand me downs from every male member of Nick’s family dating back to the early 90′s. I have more boxes full of boys’ clothing than I know what to do with). I actually had a lot of fun doing some online shopping for his fall wardrobe last week. Is it just me or is boys’ clothing getting cuter? Or maybe I’m just getting better at finding what I like–simple colors and patterns that are easy to mix and match and not plastered in cheesy graphics (though I couldn’t resist that lettered hoodie). Top row: I may have gone a little overboard with gray shirts, but they’re just so practical! Gray doesn’t stain as easily as white but still goes with almost everything, and with simple basics like this I can easily layer more colorful short-sleeve shirts left over from summer to make his wardrobe more interesting. Second row: I love a good stripe. All of these shirts are casual enough for play but still cute enough for pictures, and in colors that I know will flatter Jack’s warm coloring. Third row: I about died when I saw that Old Navy carried baby skinny jeans for boys. He’s gonna be so cute I could just eat him up. I may still pick up another pair of pants if I see some at a good price. And as for outerwear, it doesn’t get too cold in Louisiana but a light jacket and hat are necessary for outdoor play. I’m hoping to get some extra use out of that plain gray hoodie by incorporating it into a Halloween costume (more on that if I’m successful). The hat + mittens was a total splurge. I needed to get my Old Navy order up to $50 to qualify for free shipping and, as mentioned above, I’m partial to a cute stripe. Fourth row: Old Navy pajamas were way cuter, but about $5 more expensive each and since pajamas are worn almost exclusively while sleeping I couldn’t justify the extra cost just for cuteness. We have a couple of pairs of soft pants that we’re hoping to match with some of the long sleeve shirts pictured above to stretch us to a week’s worth of pajamas. After using a couple of coupon codes I was able to get all of this for only $153! It was actually $159 if you count shipping from Carter’s, but I’m still calling it a win. The first package arrived yesterday, just in time for the decidedly autumnal weather we’re expecting this weekend (low of 54° on Sunday, BUNDLE UP PEOPLE! Nevermind that the high will be 79°, haha). Have a great weekend, y’all, and thank for reading! That’s a great deal, especially for everything brand new. I recently realized I had a similar problem after my nearly 3-y/o grew two sizes over winter. I had a similar shopping list ready to click to pay when I checked Craigslist. I got a huge bag of 80 pieces of clothing in his current size and the next for $50. A steal! Great brands, excellent condition. Who doesn’t love saving money? WOW, what a great deal! I looked at Craigslist, eBay, and our local moms buy/sell/swap facebook group, but didn’t find anything so awesome as that! I have had good luck with secondhand sources in the past, though. I even find designer baby clothes at Goodwill fairly often! Since I have two children, one of each, I found that you get a much better quality of hand me downs for girls than boys. I don’t know if that is because people tend to buy more for girls so they don’t get as worn or what. My daughter was first, born in 1979. Her closest cousin was a boy who was nearly 10 years older than she was. She ended up with lots of out of style clothes. A toddler girl in bell bottoms. I would try to use those clothes for at home, but then I found that people thought I was cool and dressing my baby in vintage clothes. LOL I was just poor, but vintage sounded better. It is good you had a boy first, girls can get away with wearing boy’s clothes better than visa versa. Any way, I love your choices. Good deal. Vintage! So fun! That’s a good idea about putting a girl in some boys’ clothes. I’d been thinking that if I had a girl next that all these clothes I’m packing away will be useless, but maybe not! Our babies are really close in age and I have also noticed that I’m having to buy more clothes now…the gifts are kind of “drying up” at this stage. She’s also the oldest baby on both sides, so not a lot of hand-me-downs. You really did score! I need to get out there and get Maggie set up for fall. You’re so right, the gifts used to roll in! Jack is the only on both sides of our immediate families. A couple of my cousins have boys but they live far away. Nick’s mom and aunt have given me a ton of stuff from when their boys were little–I found a toddler jacket that belonged to Nick in one of the boxes! 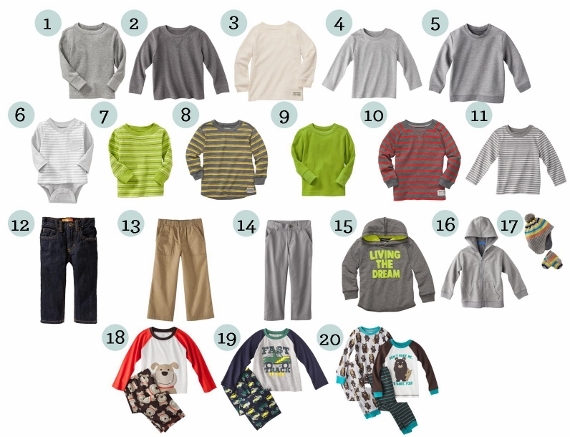 I have a two year old boy, and I’m pretty picky about his wardrobe. Picky but CHEAP. Old Navy and Target are great resources, and Carter’s PJ’s can’t be beat. But I’m going to let you in on a little secret regarding the BEST skinny jeans out there: WAL-MART! I actually buy my son the girls Jordache brand skinny jeans, and they are around $8. I just got my son a new pair on clearance for $3!! Don’t tell anyone, but because they are technically girls jeans, the stitching on the inside of the waistband is pink. But only the inside. They are the most adorable jeans, especially with high tops. Wow, I never would have thought of that! I’ll have to check out the girls’ department sometime! And OMG, the idea of baby high tops slays me.